Since Ronda Rousey’s 34-second decimation of Bethe Correia at UFC 190 on Saturday night, the MMA world has giddily imagined what a matchup between the 12-0 Rousey and 14-1 Cris ‘Cyborg’ Justino might look like. The problem is, the potential fight will almost surely never happen. The first issue is Justino is part of Invicta FC, the second is Rousey’s belief that she is still using steroids. In 2011, Justino tested positive for an anabolic steroid and was stripped of Strikeforce belt. It’s something Rousey never let’s anyone forget when the prospect of a fight is brought up. 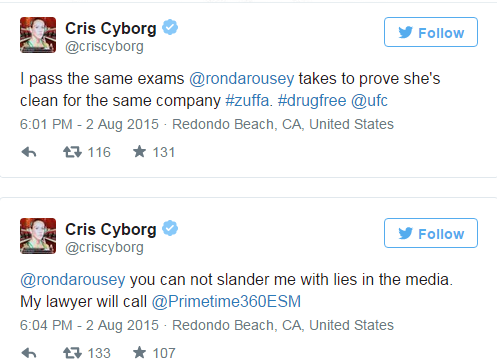 These comments touched a nerve with Cyborg, and she responded in turn on Twitter. 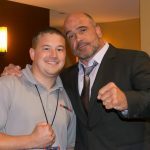 ***MyMMANews.com Editor note – The UFC recently filed a legal lawsuit against Wanderlei Silva after several accusatory statements against the promotion by which he is employed. If Cyborg does follow through with a defamation case against Rousey, she will be served and has a brief window of time in which to respond in writing. Then, the court issues a scheduling order, which gives all the important deadlines in a case. At that point, the process called “discovery” begins. Discovery is the formal investigation undertaken by both sides to a case. Each party will send the other (through attorneys) written questions called Interrogatories. Once the discovery process is over, settlement negotiations typically begin in earnest. Attorneys think about settlement throughout the case, but the discovery process provides the information that most attorneys need to assess the likely outcome of the case (should it proceed through trial), and they can advise their clients about settlement, armed with this information. Given Rousey’s significant pay structure, if she is found liable and ordered to pay restitution the settlement could be pricey. We will keep you updated as this unfolds.